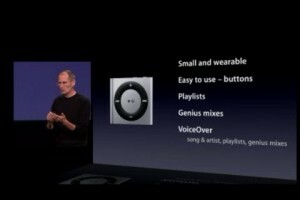 The new shuffle is redesigned to include buttons again, despite Apple removing them on their last iteration of the player. The Shuffle also includes playlists, genius mixes and VoiceOver for song title, artist, playlist and genius mixes. The price starts at $49.00 for the 2GB version. 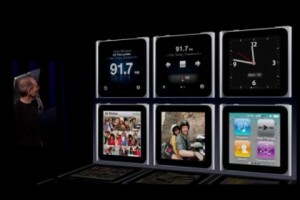 Perhaps some of the coolest new features on an iPod were introduced on the new Nano. The nano is tiny, near shuffle-tiny. It also now includes a mini-multi-touch display on it. Swipe the screen for different views, use two fingers to rotate the screen (depending on how you’ve clipped it on you) and more. The new Nano includes: Multi-touch user interface, 46% smaller and 42% lighter, a clip (a la shuffle), volume buttons, VoiceOver, FM Radio, Nike+, pedometer and supports 29 languages. 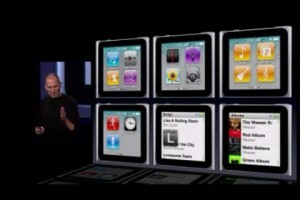 Prices for the new iPod Nanos are: $149 for the 8GB and $179 for the 16GB version.